Innovation capital is one of the primary catalysts to value creation. And while understanding and investing in innovation capital is crucial, building innovation capital lacks the focus it deserves. In fact, it isn’t even on most people's radar. If you Google “innovation capital” for instance, you tend to get venture capital companies as search results offering financial capital and hijacking this term. That needs to change. Our challenge today is to rethink organizational capital as we undergo the transition from a knowledge economy to an innovation one. The new innovation-based economies truly focus on value creation. How we define, measure, and manage the value creation enablers is the tricky part. I'd like to offer a fresh view on capital. Separating them helps us understand the building blocks of the different types of capital. Let's start with the vast knowledge inside the organization, as this forms learning capital. 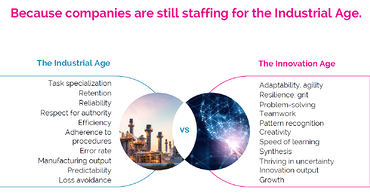 We're all expected to combine our existing internal knowledge with the external knowledge that flows into the company these days, so we can use these new combined insights that eventually create different sets of advantages – ones that foster value creation. We often refer to this as open innovation. Having access to both internal and external knowledge and not just relying on internal expertise is critical to compete in today’s world. The general trend towards open innovation is rapidly changing our thinking and internal processes. The challenge is to rethink how we build and grow our capabilities, competencies, and capacities in new ways. By constantly combining, deconstructing, and reforming, we provide our "best" resource (or capital). Addressing these challenges or opportunities using our newly-founded capital can trigger new growth or value. Knowing our capital and what makes them distinct is important. We tend to always refer to financial capital as the essential building block to foster innovation and value creation, but this is only partly true. The actual "growth engine" is the combination of many capitals that fuel our business. Physical knowledge and human capital make up our "learning capital," which is often summarized under the generic term "intellectual capital." Even though there are many intangibles within their makeup, I prefer calling it "learning capital," as it adds value to the tangible assets. The recognition of both tangible and intangible assets affects the ability of an organization to create value. Value creation manifests itself in outcomes. The combination of the different capital and our innovation outputs is key to this value creation. The unique combinations enable the distinctiveness of one organization over another. Knowing your capital can also help you understand an organization’s resilience and capabilities, as well as its adaptability to new circumstances and responsiveness to changing market requirements. Our basic framework and tool for value creation is the business model. The very inputs from all capital (creativity, innovation, fresh capital, market targets, and products that meet customer needs, for example), and how we combine them, transforms them through different business activities. The interactions combine to produce outputs or outcomes of the sum of the business model approach. The rest of this post will focus on innovation capital, which includes human, knowledge, and physical capital as innovation capital-related assets. Innovation capital is composed of many variable, interconnected, and context-specific assets that map out and align your strategic goals or aspirations. "Innovation capital is the sum of all that promotes the development and changes required for achieving innovation outcomes within one organization, or its broader networked environment, for marketplace advantage. These are made up of the resources, processes, knowledge, and capabilities that are constantly evolving and highly dynamic to build greater innovating capacity. They build new capital and draw from the dynamics within innovation to provide the true value creation in successful outcomes in the final product, service, or executing the business model." The hard part is knowing how to truly value innovation capital, as it is always evolving to meet new challenges, create new opportunities, and enable sustained success. We need to understand what is and isn't essential for that innovation challenge we may be working on. Aspects (processes, software, established procedures, standard approaches, etc.) must be differentiated between static or dynamic. Static aspects are repeating and tend not to add any more value whereas dynamic aspects are ever-evolving, improving and boosting innovation and adding increased value. A lot of what we do in innovation is repeatable or follows a specific pattern or routine. This "static," repeating part is essential but not a major generator of fresh innovation capital. By adopting an exclusively repetitive approach to innovation, you may limit yourself to only incremental improvements. However, the key to success, to really push innovation, is leveraging all that built-up capital. We all need to build a certain knowledge stock, which we continually add to and which makes up our inventory and sets of experiences. We also all need to continually search for flows, which exist in our relationships and networks that give us new sources of stock or knowledge. By generating new stock, we’ll be able to build the values of our future capital. It is these unique bundles of an organization’s resources and assets that give us our fresh innovation value through the process and flow of new value-creating knowledge that promotes commercialization. It is the dynamic interactions and flows between the different innovation capital assets and other intellectual assets that nurture innovation. Absorptive capacity plays a vital part in structuring this process. Leveraging and building the stock of our innovation capital can result in different productive outcomes. First, we need to identify the innovation capital required by these stocks and knowledge – building assets and their uniqueness in various combinations. The better we understand them and know how to mix and match them, the better future potential for new wealth. Only the constant flow and creation of knowledge drive successful commercialization. The more we can encourage both internal knowledge flows from internal and external sources, the better we can generate knowledge assets and increase innovation value. As these grow, they make it potentially more dynamic. Most corporate boards lack any clear idea and vision of innovation capital. This lack of understanding significantly holds innovation back. It constrains growth and leaves us all less sure about the future. Boards feel uncomfortable about not knowing how and where to invest money for new growth. They are neither aware of the vast innovation capital available nor the opportunities provided. We are failing to leverage what we have and not giving them the understandings and confidence to support innovation more rigorously. The challenge is to cultivate true awareness and a deeper understanding. This is a challenge for all of us, not just for corporate boards. Value creation manifests itself in outcomes from those "stores of capital" that result from an organization’s activities. The more dynamic they are, the more they will affect the ability of an organization to create value or not. Innovation is central to value creation and aimed at generating and innovating new outcomes that distinguish the organization from others. Value is created through an organization’s business model, which takes inputs from the capital and transforms them through business activities. Today, it is about recognizing what makes up the value creation capital. A dynamic business model is crucial to capture this process of change, and to provide the value creation desired. What makes up innovation capital stock? Innovation capital as renewal capabilities of our organizations in the form of producing intellectual properties that offer value and are increasingly being extracted from our intangible assets. Innovation capital possesses attributes that make it a "strategic" asset. The key to success lies in specifying the nature and application of these assets in relation to the new knowledge flowing into the organization. This generates and commercializes concepts and ideas into new forms of innovation value. Innovation capital is made up of the ongoing "dynamic interactions" between intangibles and tangibles. Built up from experience over time, they develop into mostly intangible assets, and eventually into valuable outcomes. It is the effective use of different kinds of intangibles that contribute to innovation capital. Only a few of them can be formally captured as they are built on interactions, relationships, applied experience, generally accepted understanding and based on pattern recognition and meaningfulness. As we grow our networks and relationships, we increase knowledge sharing. This promotes our understanding and provides increased intangibles inside the organization. As we deepen our knowledge, we gain experience and achieve higher "pattern recognition" and insight. We need to know how to unlock the real value of innovation. If we do not fully understand where capital comes from, how new capital and stock are provided, innovation will remain tentative, always stuttering along, lacking this organization innovation rhythm. Key elements of innovation capital consist of mostly non-technological intangibles embodied in the organizational routines and employees’ mindset. "Internal learning" refers to the creation of new knowledge within the enterprise, while "external learning" pertains to the integration of knowledge from outside. We can model innovation capital and apply different capital needs to different innovation challenges to leverage them in more dynamic ways. The more we strengthen our knowledge and appreciate the value within our people, the more we can generate new knowledge, build greater narratives, deepen discussions, and establish better connections and interactions across growing communities.In this way, we can turn innovation capital into highly dynamic and valuable assets, just as we treat financial capital today. The more we discover, the more knowledge we gain. This enables better decision-making and fosters our value-creating potential. This will, in theory, give us greater confidence, both internally and externally, that our invested financial capital is in good hands. We are effectively applying innovation capital to value creation. Our learning capital needs to emerge and dominate future discussions in improving its quality and value contribution. We need to increase incentives for organizations and their people to learn or update their existing knowledge. The power lies in the linkages we can forge, in acquisition, in assimilation, and eventually in transformation that allows known and new knowledge to fuel our wealth-generating innovation pipeline. Adapting to fast-moving changes is key to our success. It is the combination of our capital, and knowing what factors and assets contribute to our innovation capital, that will determine the health of our future. Going forward, it is essential to significantly increase our innovation capital focus so it can be fully unlocked and release the true dynamics within our organizations’ system and structures to exploit innovation’s true potential. Innovation capital is the key aspect we need to focus on, understand, and invest in. It drives our future ability to develop and sustain value creation.